Spine can import data from other Spine projects, allowing projects to be combined. Spine can also import data in the same format that Spine exports, allowing skeletons to be imported from other programs. Spine can import a skeleton or animation from another Spine project. This can be used to move skeletons from other projects into a single project. Importing an animation can be used to have multiple people working on the same project, with some limitations. 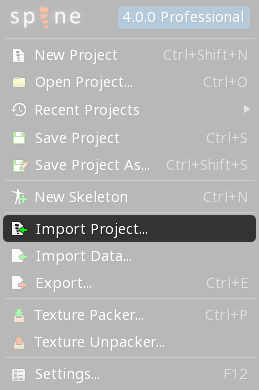 To open the Import Project dialog, click the Spine logo in the upper left if Spine and choose Import Project from the menu. Enter the path to the project file to import and choose to import an animation or a skeleton. When importing an animation, choose which skeleton and animation to import, as well as which skeleton to import to and the name of the animation once imported. The skeleton that the animation is being imported to must have bones, slots, attachments, events, and constraints with the same names as the skeleton that is being imported from, but only for those items that are actually keyed in the animation being imported. Additionally, for deform keys, the mesh must have the same number of vertices in both skeletons. When importing a skeleton, choose which skeleton to import and the name to use for the skeleton once imported. Spine can import data in the JSON or binary formats that it exports. This provides a path to bring data from other programs into Spine, such as from Photoshop or After Effects. 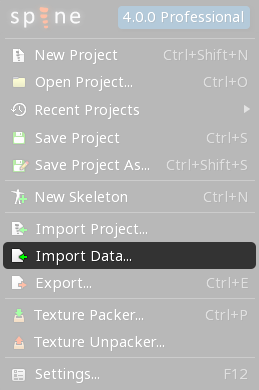 To open the Import Data dialog, click the Spine logo in the upper left if Spine and choose Import Data from the menu. Enter the path to the JSON or binary file to import, a name for the skeleton once imported animation, and a Scale. The import data Scale changes the size of the skeleton without changing the scale of any bones. All the appropriate data is scaled: the position and length of bones, attachment offsets, bounding boxes, meshes, animations, etc. If a Spine project was created with images that are the wrong size, the project can be exported to JSON with nonessential checked and then imported again using Scale to change the size of the bones. The new project would then use images with a different size. For example, if a Spine project is created with images that are 4 times larger than necessary, it can be exported to JSON with nonessential checked, then imported to a new project with a scale of 0.25. The images used for the new project should be 25% the size of the original images. Spine can also import Spine project files and JSON or binary data using the command line.